Yesterday was a day of mixed emotion as I took my youngest to Heybridge Basin. We fished the first swim and in the first few minutes had a nice Rudd and lost (never saw it) a large fish. At the end of the session we’d had two Tench of approx 3 and 4 lb, my biggest ever Perch of approx 1.5 lb plus loads of Rudd, Roach, Bream, Perch and Eels. Now the downside… I lost a really big perch and a really big slab and when we went to bring the keepnet in there were only two really small fish left in it as there was a big hole at the bottom of it. I looked at Mark and we both fell about laughing!!!! That said what a great afternoon and conditions were far from perfect as it was so windy. Hopefully, armed with a sewn up net, Dave and Mark will be returning to do battle with the beasts of the Basin again soon. When our editor compiled the winter newsletter he decided to include some photos from our gallery and was hoping to find some snaps of tench, roach, perch, chub, bream, crucian, pike etc to select from but instead he founds loads of photos of carp and not much else. As most of us appreciate that carp are very photogenic this was no surprise to me. 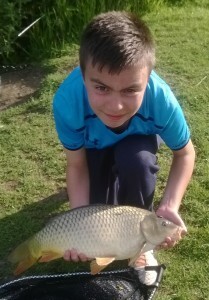 Anyway he suggested that we run a small competition to increase the number of non-carp photos and here it is. The member who submits the best non-carp fish photo in 2015 will win a half price membership for 2016-17. Closing date for entries is 24th Dec 2015 and the editor’s decision is final. You don’t have to do anything fancy to enter, just submit your non-carp fish photo along with the date it was caught, its weight and the venue to the gallery in the usual way. Please remember that the gallery cannot cope with any photo greater than 2mB in size so you might have to downsize before submission. 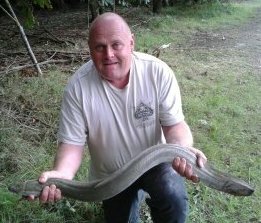 As you know the membership secretary has a new penchant for eels and the early front runner is this huge eel caught by Alan King from Bog Grove. It’s actually quite difficult to tell which end the eel’s head is (this is not an additional competition). 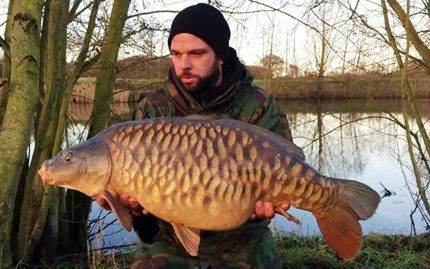 The bar has been set extremely high although beauty is in the eye of the carp-holder. Get out there, get catching and get snappy. We have acquired a new still water fishery, named Slough House West. 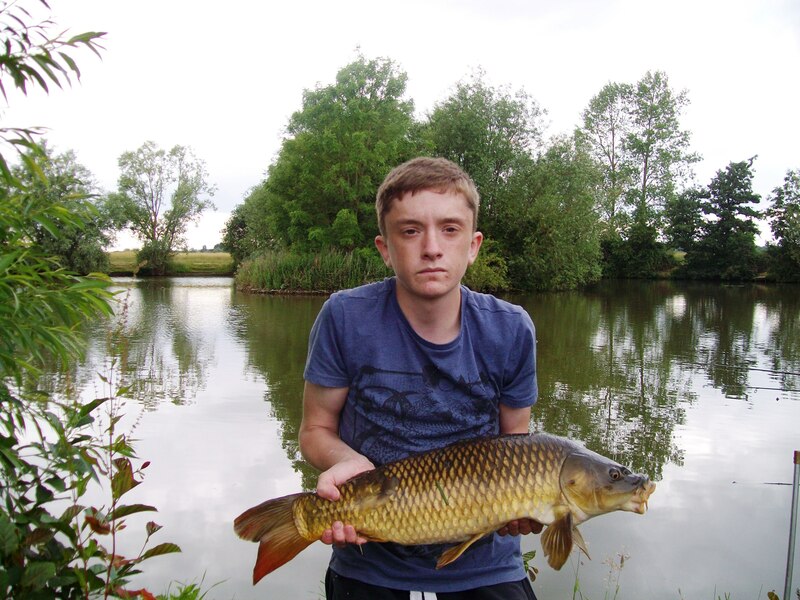 As the name implies, it lies close to our existing Slough House fishery. The lake covers around 1.5 acres, has a small island, surrounding trees and reed beds and has a pretty uniform depth of about 3-5 feet. Early reports are that the water contains a very good head of carp up to around mid doubles, lots of small roach, interspersed with some larger specimens, together with a few rudd and eels. There are about 20 swims (though one is currently obstructed by a fallen tree). Some have platforms and please exercise care when using these as some of them have relatively narrow plank entrances. Fishing is allowed from 5 am to 10 pm and the water opens on July 1st. Access is down the track directly opposite our entrance to Slough House Farm, but on the other side of Scraley Road. Please be aware that you are entering a working farm – look out for chickens, dogs, tractors etc. Follow the track passing farm sheds on your left for 100 yards, or so, until you see a MAS notice on a building directly in front of you. Turn left between the farm sheds and then right at the end, where there is another MAS sign. The lake is then immediately in front of you. Turn left and park in the open area next to the lake. We will arrange for a better defined parking area when the landowner has cleared more of the site. George Kemp with an 11lb Common, the largest of a three carp catch from our new lake Slough House West. Still tomorrow is Canal and River time so pray we get some nice Perch, Bream and Eel photo’s to share. Tight lines – Dave.